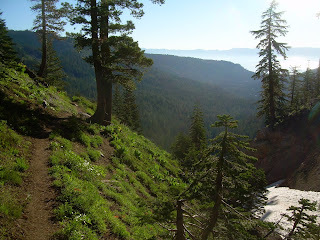 July 12: I woke up, on my exposed ridge, to a beautiful sunrise over Lake Tahoe. The trail quickly went back down into the trees, but it wasn't there for long before it rose back up onto another exposed ridge and I spent most of the morning and afternoon above treeline enjoying the views. Hiking in the trees gets kind of boring--I can see trees anywhere, and they all start to look the same after you've seen your ten millionth tree. The views, however, never got boring. After an hour or two of hiking, I could see a radio tower nearby and was looking down on the north side of Lake Tahoe and was able to get a signal with my cell phone, so I gave Amanda and my mom a call to give them an update on my progress. While talking with my mom, GQ hiked past me--surprising since I thought he was ahead of me. He passed my campsite the evening before, so I know he was ahead of me at that point. He must have camped somewhere far enough off the trail that I passed him and didn't know it. The helicopter buzzed over me on this ridge. While talking to Amanda, a helicopter buzzed over the radio tower and followed the ridge, more-or-less the same route as the PCT, and buzzed me, probably not much more than a hundred feet above me, then circled around back towards the radio tower. It seemed like the helicopter was searching for something, and it make a few circles following the PCT or the Tahoe Rim Trail which also veered off nearby, but I never did figure out what it was doing. It was close enough that Amanda could hear the helicopter through the cell phone, though. The ridge walking was wonderful not just for its views, but also for it's relative flatness and lack of snow. Even the ski area we went through had no snow. Once again, the trail went down a steep slope, this one covered with a sizable layer of snow and I briefly lost track of the trail. I started following footprints straight down, then stopped about halfway down. I can't explain it, but the footprints felt wrong. It seemed like there was a change in the footprints, even though I couldn't really identify exactly what it was. I looked toward the bottom of the steep slope, hoping to see a sign of the trail, but I saw nothing except for the footprints in the snow. Looking up, I could see what appeared to be a switchback to the trail perhaps 20 feet away. 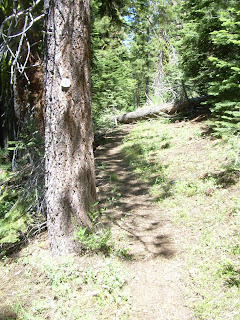 At that point, I knew I was still on the trail, and it looked like it did go down the slope, but it still bothered me. It just felt wrong to keep going down. 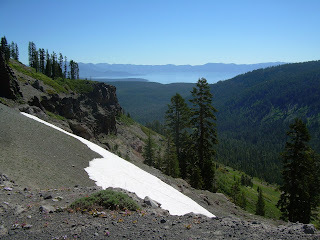 Views of Lake Tahoe in the background. So I scrambled up the 20 feet to the proper trail, just as it left the snow. Or was it entering the snow? With as twisty as the trail was, I wasn't completely sure which direction on it was north, and a compass wasn't going to help in that regard. 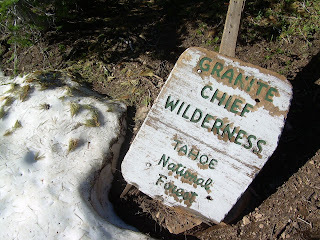 I decided to follow the trail away from the snow since I'd quickly lose it in the snow anyhow and see where it went. It would probably continue switchbacking down the slope, but at least I could follow it for five or ten minutes and see where it led to. Try to confirm or deny if I was actually walking in the correct direction. The trail didn't go down the slope, however. It flattened out and started climbing again, gently. It seemed like the trail was heading in the right direction, however, but I was still uncomfortable that I might be hiking in the wrong direction. I hoped to see a trail marker to definitively confirm that I was on the right track, which, as it turned out, I was, but it would take nearly a half hour before I could be 100% certain that I was. I don't know where those footprints going down the snow led, but whoever made those, I thought, were probably quite lost. that I was still on the right trail. 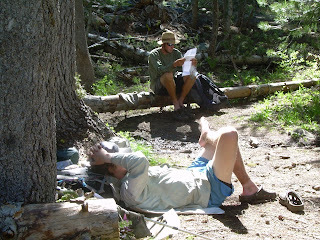 Near lunchtime, I caught up with Fully Loaded who was resting on the side of the trail, who told me of his misery camped in a swarm of mosquitoes. It made me feel better ditching everyone else to camp on the exposed ridge where mosquitoes were practically non-existent. About ten minutes later, GQ caught up with us again and stopped for a break as well. 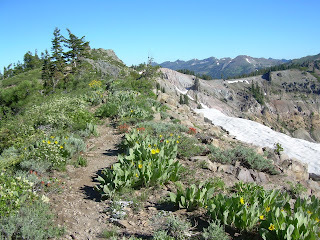 After a good half-hour or so, we were packing up and getting ready to leave when Shroomer showed up behind us, thrilled about how excited he was to see us and confirm that he was actually on the Pacific Crest Trail. Then he proceeded to tell a story of misery and hardship, following footprints through a snow down a steep slope. At the end of the snow, he had trouble finding the trail, but valiantly plodded on, bushwacking and getting more and more lost with every step. 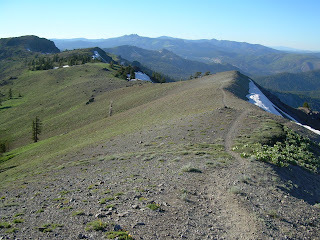 Finally, from a distance, he could see what looked like a trail far up on the ridge and figured that must be the PCT, so he started bushwacking towards it. When he saw someone up on the ridge, he hollered out, and someone hollered back. I thought back to when I was walking along that ridge, and I vaguely remembered a faint shout far down the valley. I hadn't bothered to reply (surely it wasn't meant for me! ), but now I knew--it was probably Shroomer I had heard, and it very well could have been me he saw on the ridge. The insects seemed to be getting larger. 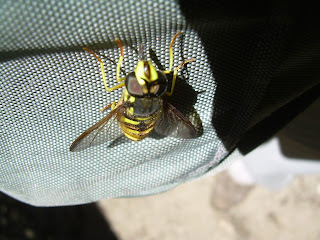 This one landed on my pack. After two hours of bushwacking, Shroomer finally found a trail. He couldn't be certain it was The Trail, although he knew that it probably was, until he found Fully Loaded, GQ, and myself snacking on the side of the road. "That was the most lost I've gotten lost on this entire trip," he told us. "Even in the High Sierras, I never got lost this badly." Shroomer pulled out his cell phone and tried to call Little Engine and Plain Slice, to find out where they were on the trail. They didn't answer their phone--most hikers, obviously, don't leave them on for very long on the trail even when there is cell phone coverage since there's no way to recharge such devices--so he left a message about getting horribly lost for two hours and was probably far behind them. Some of the signage has seen better days! A few minutes later, Little Engine called back saying they had gotten even more lost, unable to reconnect with the PCT for three hours, and that they were actually behind us on the trail. But they were back on the trail and--knock on wood--back on track. I laughed. I couldn't help it. It was those footprints in the snow. That could have easily have been me had my instincts not told me to stop following those footprints in the snow. I still don't really know what set off my alarm bells, but I'm glad I listened to them. Near the end of the day, I pushed on to a ski hut--Bensen Hut--hoping the enclosed interior would protect me from the mosquitoes that would likely come out in force during the evening. 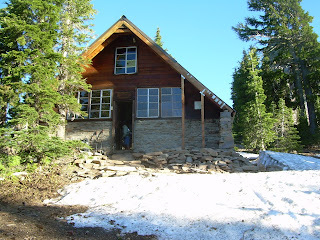 The hut was beautiful and warm, and I laid out my gear on the upper floor for the night. Shroomer camped out in one of the beds on the bottom floor, and Little Engine and Plain Slice decided to camp in their tent outside. They spent the evening inside chatting away with the two of us, though. GQ and Fully Loaded pushed on to do a few extra miles before stopping for the night. but I think the box needs to be replaced! Fully Loaded (front) and GQ (back) taking a break. The views along the ridges were absolutely amazing! inside, I left the window open all night long. 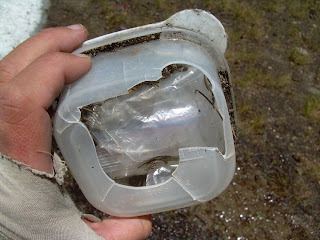 I'm surprised more people don't have solar chargers on their hikes. I know the objective is to pack light, but our charge is really small and works quickly. Good thing you trusted your instincts. That hut is cute. I was going to ask you if you found very many letterboxes along the PCT. What a neat surprise to find one so old and not found for such a long time.